Have you ever been overwhelmed by the sheer amount of ‘stuff’in your life? Preoccupied and distracted by the piles of things around you, the tasks you haven’t done, and the clutter in your head? Have you ever wished you could banish that clutter once and for all and create the clarity and calm you long for? I understand how and why people allow clutter to build in their lives, and what an enormous or even impossible task it can seem to deal with all the things and all the tasks. I am here to help. EAT THAT ELEPHANT describes my proven formula for banishing physical and emotional clutter from your life! But once you start, and especially if you have support and guidance, you can quickly and effectively “eat that elephant” – and move mountains too! You can make that first step easy for yourself – simply get in touch with me. I welcome the opportunity to help you eat your elephant – a bite at a time. All of this is available to you following your FREE 20 minute consultation. 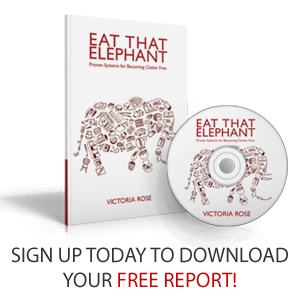 AND, all my clients also receive a FREE copy of my book EAT THAT ELEPHANT - Proven systems for becoming clutter free. Contact me today to understand how change in your life can clear the way for your future. Vicki looks at a space, sees where the energy is stuck, and has both the passion and the tools to get things moving. Her belief in the speed with which it can be done is a powerful force. Previously what I wanted to do most, I never got round to. Basically I am now decluttering my days of all the bits and pieces I normally did but now realize I don’t need to and i have more time for fun things! [Victoria] helped me be clearer in my own mind about my priorities. I am very grateful to Victoria for her help, and highly recommend her to anyone wanting to bring more order into their home or workplace. Liberating and organising yourself and your environment has to be done in the same way you would eat an elephant - a bite at a time.